. Benten 弁天 / 辨天 / 辯天 / Benzaiten 弁財天 .
. 冬木弁天堂 Fuyuki Benten . 江東区冬木22-31 Koto ward, Fuyuki - the shrine of the Fuyuki family.
. 須崎弁天 / 州崎 / 洲崎 Suzaki / Susaki Benten .
. 滝野川 弁天 Takinogawa Benten .
. 区余丁 Yochomachi - Nukebenten .
. daija, orochi 大蛇 the huge serpent, great snake . 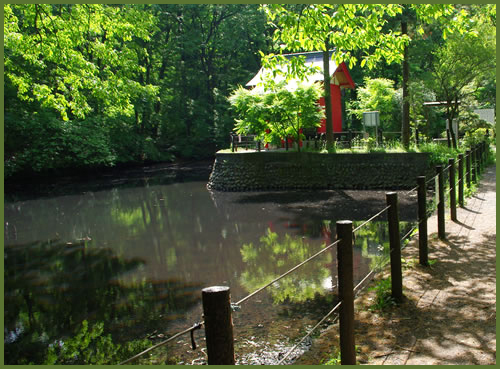 - often associated with a Benten pond.
. Inokashira Benten pond 井の頭弁天 / 井ノ頭辨天池 . Once a young priest was cutting weeds when by mistake he cut the mouth of a small serpent in two. This small snake was in fact the dragon living in Inokashira pond, so the river out of the pond was carrying blood for three days. The young priest died from this curse. The top part of the serpent dragon head flowed all the way to a temple in 中野 Nakano. 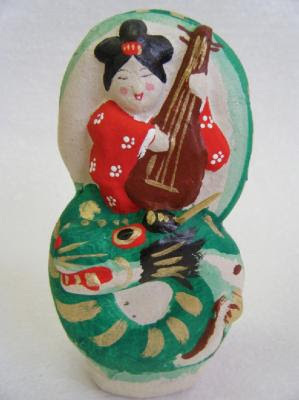 The lower of the serpent dragon head is kept at the Inokashira Benten. These bones were used for rain rituals. If it had not rained for a long time, the bones were taken outside in a special ritual - the then rain would fall! The 佐内家 Sanai family did not have any children. So the wife went to the Inokashira Benten to make a wish. Indeed, soon after the gave birth to a girl. The neighbours said this was 神の申し子 a god-given child. 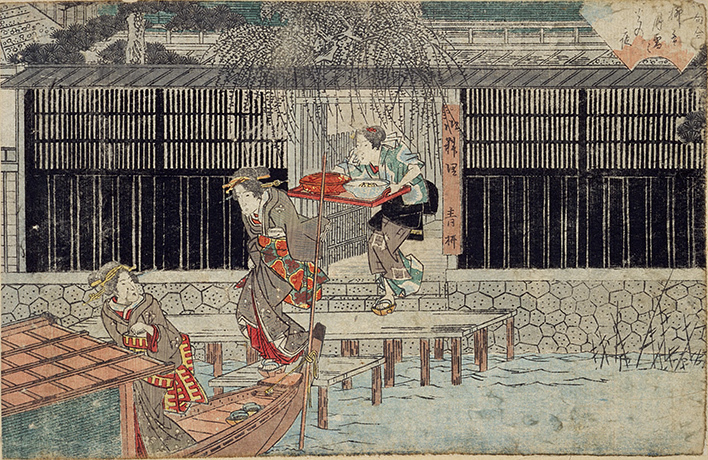 When the girl had grown up, the mother took the girl and both went to the Inokashira Benten to give thanks. The girl suddenly turned crazy, went to the pond, stared into it and then was lost in the pond.
. Legends from 吉祥寺村 Kichijojimura village . On 八丈島 Hachijo Island there was a swamp and a huge serpent was the master of it. At night it came to the village to kidnap women or cows and threaten the villagers. 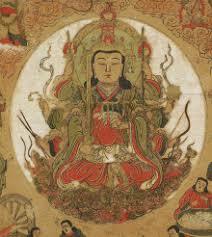 Then came 為朝 Tametomo and killed the huge serpent. 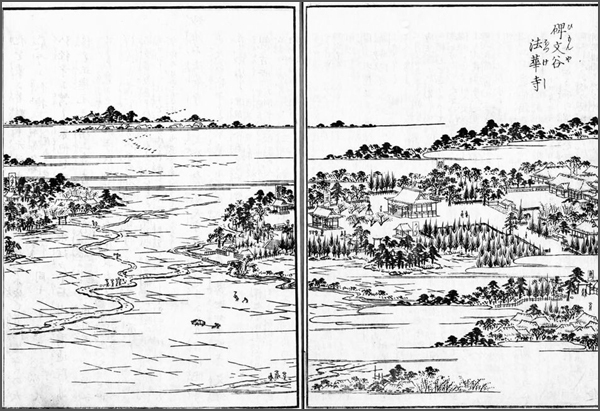 He cut it into eight parts of about ichi joo 1丈 3 m each, hence the name of the island, hachi joo 八丈 Eight Jo. The pond became red with blood and was called アカミショー （赤み沢）Akamisho. To appease the sould of the serpent, a sanctuary of Benten was erected. A retainer of Tametomo, 忠次郎 Chujiro, was killed in the event and is now venerated as チュージョー様 Chujo sama.
. Minamoto no Tametomo 源為朝 (1139 – 1170) . the Taira cut the sinews of Tametomo's left arm, limiting the use of his bow, and then he was banished to the island of Ōshima in the Izu Islands. Tametomo eventually killed himself by slicing his abdomen, or committing seppuku. 大谷弁天 Otani Benten is known for its power to help women. One day a woman came to make a wish, and when the wish was granted she came back to the Shrine to express her gratitude. Suddenly it became cloudy and dark. From the 弁天池 Benten Ike pond at the side of the Benten Shrine a dragon came out and ascended to heaven. On the way he began to make painful sounds and fell down. A lightning struck 大松 the great pine tree. The large tree split into three and out of it came a white serpent of about 60 cm. It burst into white powder and fell dead.
. ryuu, ryū 龍　tatsu 竜　と伝説　Ryu - dragon legends . near the 駒止橋 / 駒留橋 Komadomebashi bridge a rather wicked Benten was venerated. If someone passed the bridge, disrespectfully riding his horse, he would fall down. Sometimes wicked young men wearing woman's headgear came to behave badly. If a procession with a bride passed the bridge, the wedding would not go well, so nobody even tried to do that.
. kitsune 狐 the fox from temple 増上寺 Zojo-Ji . 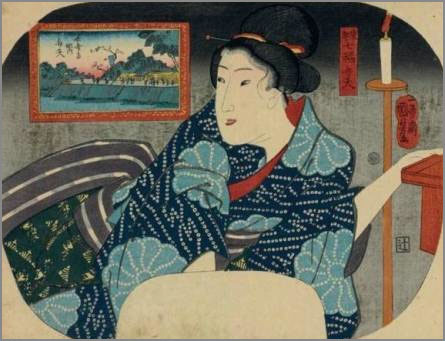 "The young wife is at the pond 長峰の池 Nagamine no Ike. When they went to look for her, she had changed into a huge serpent and lived in the pond. The family built a small sanctuary in the back of their estate and venerated the soul of the woman. There is a pond Nagamine in Niigata.
. . . CLICK here for Photos of the pond! More than 500 years ago, a young man from the village had fallen in love with お里 O-Sato, but the lord of 弁天島 Benten Island, a Tengu, also loved O-Sato. O-Sato had fallen in love with a young Samurai and the angry Tengu produced a huge flood to wash the Samurai away. O-Sato became a nun. She got healing power and a 霊泉 healing well from Benten sama and begun to heal people. They say she was an incarnation of Benten herself. This district does not exist any more. 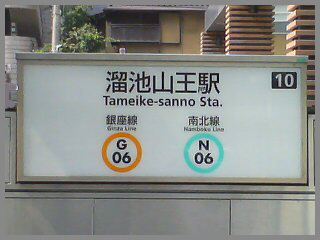 The name "Tameike" is now only used for subway stations, road crossings and bus stops. 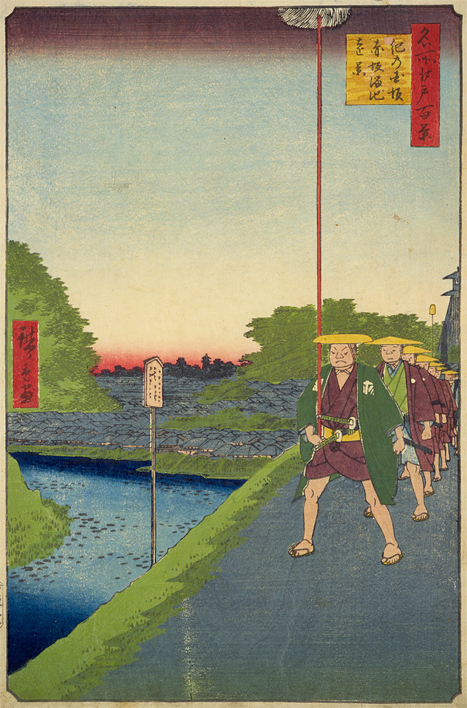 The original irrigation pond of the Edo period does not exist any more. The pond used to be even bigger than the Shinobazu no Ike pond in Ueno. Tameike is located on the Sanno Daichi 山王台地 plateau. 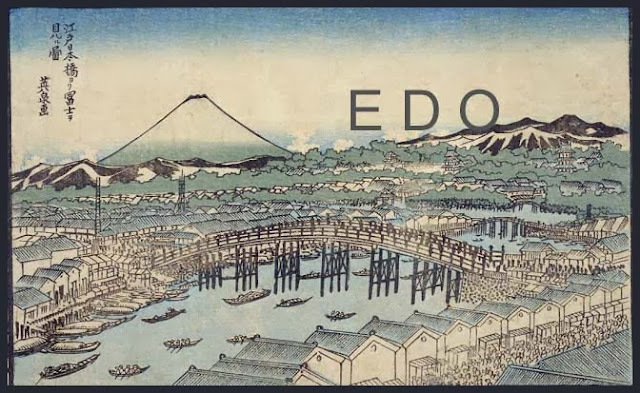 It was created in 1606 to provide drinking water for Edo. Daimyo 浅野幸長 Asano Yoshinaga got the rights from Tokugawa Ieyasu to create this artificial lake and waterways. It was a pleasant sight and with many lotus flowers in the pond in summer provided a great spot for relaxing. The nearby river was fashioned into a moat around Edo Castle, with some of it channeled into a pond used as a reservoir in present day Tameikesanno - Tameike meaning "dammed pond." The ready water supply meant a cluster of eateries developed in Tameikesanno, and in the post-feudal Meiji era (i.e., from 1868) Tameikesanno became a pleasure quarter, with well over 100 geisha houses by the 1930s, frequented by nearby Nagatacho bigwigs, among others. ... the United States Embassy Tokyo is accessible from Tameike-Sanno subway station on the Ginza and Namboku lines. 千代田区永田町二丁目 Chiyoda ward, Nagatacho 2chome.
. Sanno Gongen 山王権現 Sannō Gongen . - Hie Shrine, also called 日吉神社 Hiyoshi Shrine. During the Edo period, this was a kind of resort area for rich samurai to have a villa for summer.
. Akasaka 赤坂 "the red slope" district . was a Japanese samurai and feudal lord of the late Sengoku and early Edo periods. His father served as one of the Go-Bugyō in the late Azuchi–Momoyama period. 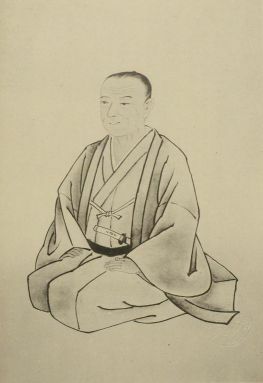 Asano Yoshinaga was born at Odani, in the Asai district of Ōmi Province, in 1576, the eldest son of Asano Nagamasa, the adopted brother of O-Ne, Toyotomi Hideyoshi's wife. He married a daughter of Ikeda Tsuneoki. 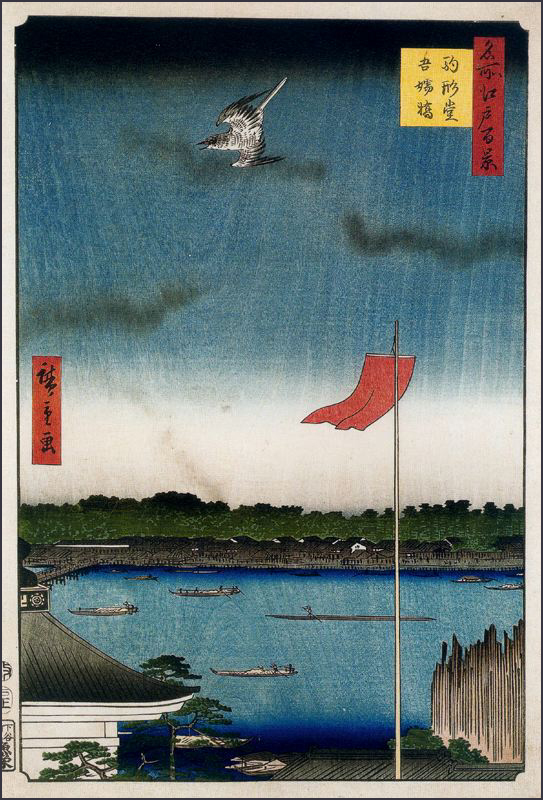 His first action was at the Siege of Odawara, in 1590. In 1593, together with his father, he was granted Fuchu, in Kai Province. 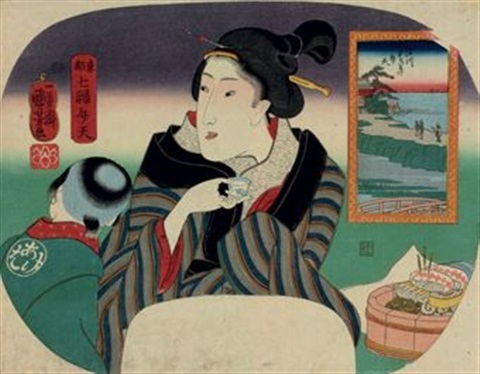 Though the Asano family was to be sent to Noto Province as a result of their implication in the alleged treason of Toyotomi Hidetsugu, the good offices of Maeda Toshiie kept them in Kai Province. 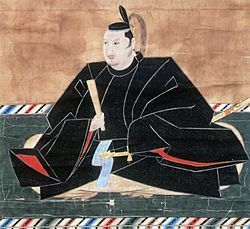 Yoshinaga achieved distinction together with his father in 1597, during the Siege of Ulsan, when they held the fortress under the command of Katō Kiyomasa. Though the Asano family was secure following its service under Tokugawa Ieyasu at the Battle of Sekigahara, it would be moved to Wakayama Domain, in Kii Province. 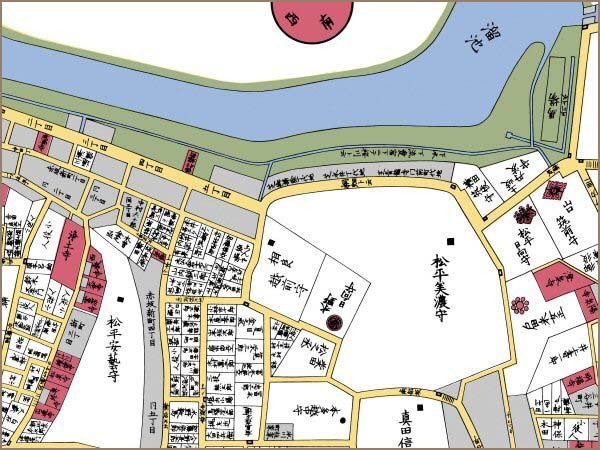 The family would again be moved, to Hiroshima Domain, in the early 17th century. Yoshinaga's three-dimensional battle standard, a gold-plated basketlike object, was well known during the Korean campaign. His daughters, Hanahime married Matsudaira Tadamasa and Haruhime (Haruhime was his daughter with Ikeda Tsuneoki’s daughter) married Tokugawa Yoshinao. Along with Rokugo Jinja, Mita Hachiman Jinja, and Unoki Hachiman Jinja, Hieta Jinja is one of the four candidates to be the Hieta Jinja mentioned in the Engi-shiki. The shrine legend tells us that in the year 709 the Buddhist monk, Gyōki, made shintai (divine images) of Amaterasu Ōkami, Hachiman, and Kasuga and enshrined them. That the three shintai existed and were worshipped is probably a matter of fact, the existence of what is now the Hieta Jinja is more one of conjecture. 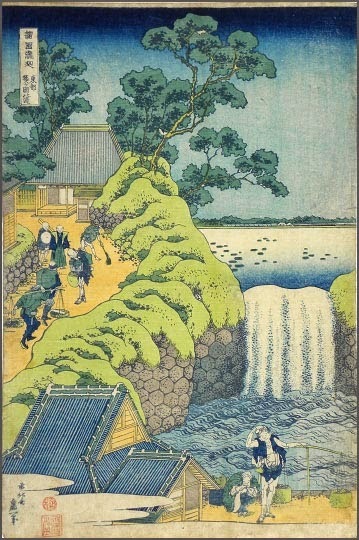 The first historical reference to what may have been a Hieta Jinja is in the Veritable Record of Three Generations of Emperors of Japan, published in 901. In the Engi Shiki, completed in 967, mention is made of two shrines in Ebara-gun, Musashi Province, Hieta Jinja and Iwai Jinja. 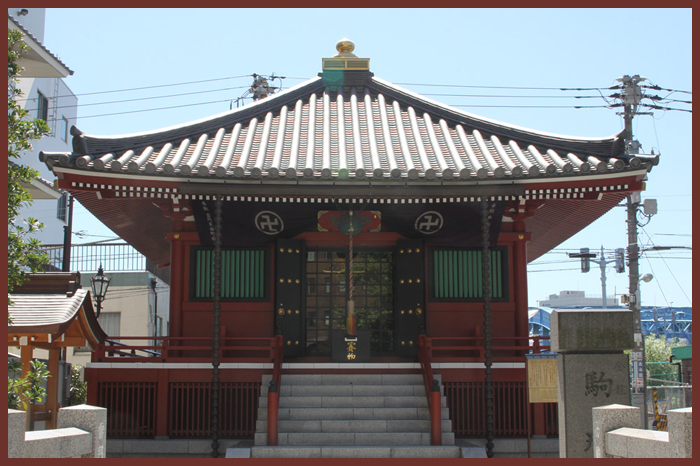 In 1872 it was designated a gōsha: it is currently a kenmusha of Kamata Hachiman Jinja. The shrine was basically destroyed in the firebombing of April 15, 1945, and while a temporary main hall was quickly put together it was not until 1954 that it was properly rebuilt. Further work was done in 2000. The koma-inu, dating to 1959, are relatively recent. Note that the two kami, Takenouchi-no-Sukune and Katsuragi Sotsuhiko are semi-historical persons, father and son , and Takenouchi is said to have been an advisor to five emperors between 71 and 399. His 73rd generation descendant, Takeuchi Mitshiro (竹内睦泰), is the current custodian of what is a fascinating, if fanciful, family history. One of the enshrined deities here is the sun goddess, Amaterasu Oomikami, considered to be the creator of the Japanese people. On the right-hand side of the main structure there are three smaller shrines with their own torii gate. 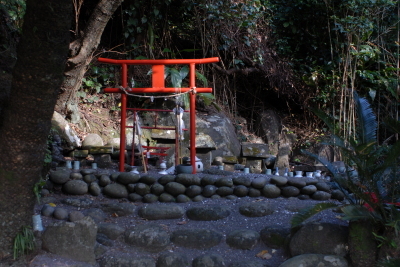 By one of the shrines there is a small pond with “pure water” written in kanji. In the pond you can see tiny fishes swimming actively. su 洲 (-zu in compound words) is a kind of sandbank or island in a river. Between the river Sumidagawa near its estuary and river Kyobashigawa 京橋川 there was a long Su, the Teppozu. Right opposite was Tsukudajima　佃島. 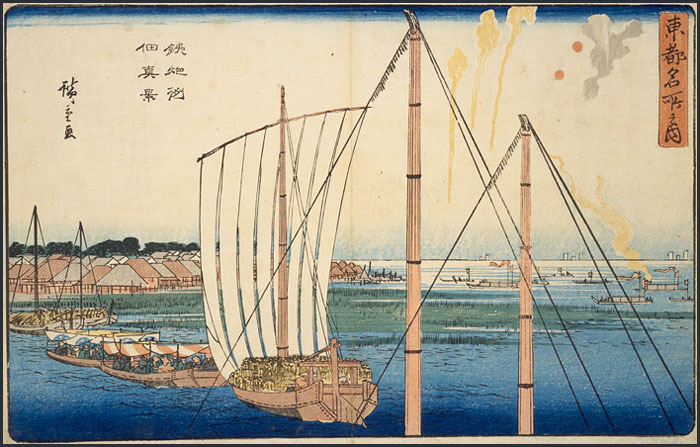 The name refers the thin long shape of the island, looking like a teppo 鉄砲 gun to the inhabitants of Edo. There were many Daimyo Yashiki estates in Teppozu. The name of Teppozu is said to originate either from the fact that the sandbars were long and narrow, like the shape of a rifle, or because of the test firing of artillery. It is said that at the time a Fujizuka (mound made in the image of Mt. Fuji) was constructed in Minatoinari Shrine (present day Teppozu Inari-jinja Shrine) and Mt. Fuji could be viewed from here. Ships from various regions entered the port at Teppozu, so the shrine was revered as a god of safety on the sea for ship passengers. In the Meiji Era it was moved approximately 100 meters to the southwest. 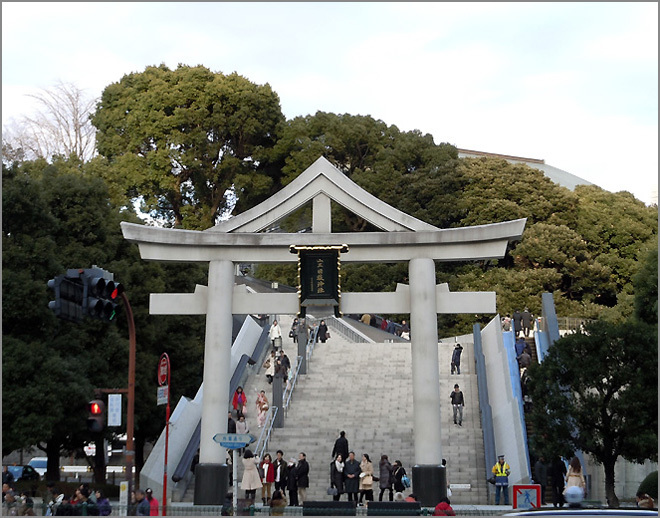 In the grounds of Teppozu Shrine (Minato, Chuo Ward), is Fujizuka (Fuji mound – a miniature Mt. Fuji), which was put together with lava rocks carried from Mt. Fuji. Many people come to make pilgrimages (or Fuji-mode) to this small-sized Fuji. The 'Mountain Opening' of Mt. Fuji took place on the first day of the sixth month of the lunar calendar and on this day, the people of Edo burnt incense in front of their homes and worship the mountain. Mt. Fuji was revered as a deity since times past and in the Edo period, there were gatherings of mountain worshippers in various locations which were called 'Fuji-kō' and the adherents made pilgrimages to the mountain and this is called Fuji-mode. There were also man made Mt. Fujis here and there in the city and so Edo residents could go on Fuji-mode without having to go all the way to the real mountain. 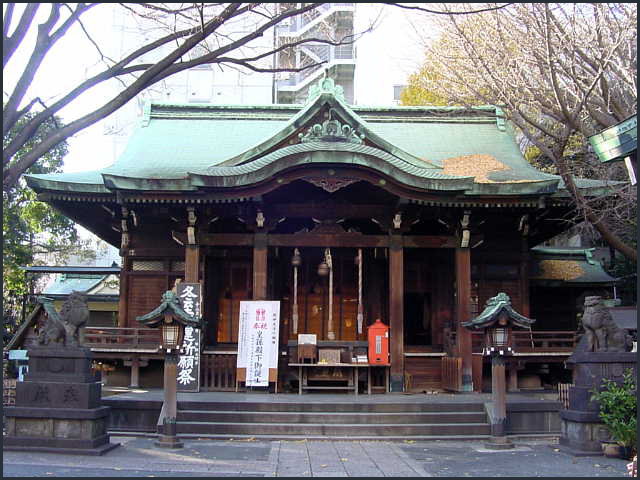 The Teppozu Inari Shrine pictured here is one of these and is famous along with Komagome, Asakusa, Yotsuya and Fukagawa. 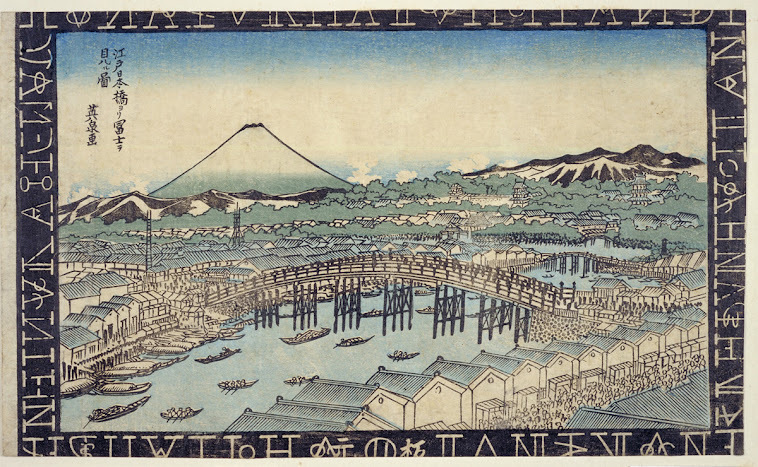 In the picture, a figure holding a parasol can be seen half way up the mountainside in the background of a man-made Fuji. 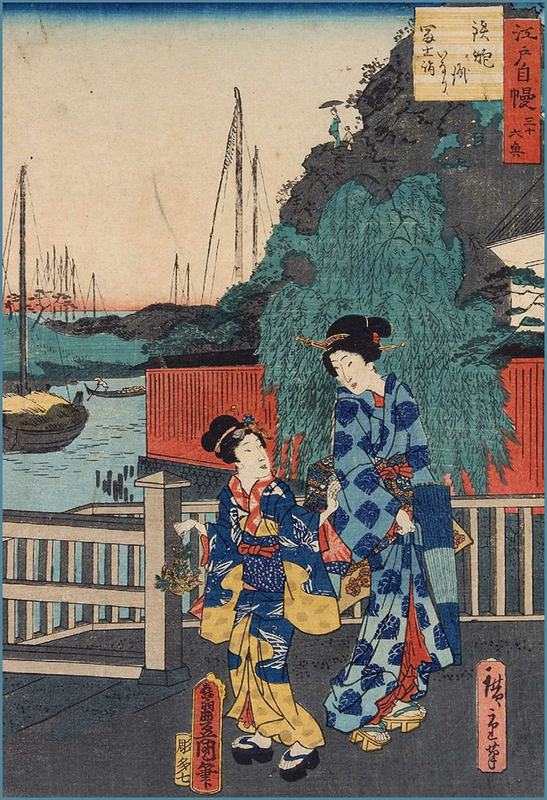 The young girl in the foreground is holding a straw snake and in around the Hōei period (1704 to 1711), these were sold as charms against diseases in Fujizuka in Komagome and after this they were sold in various locations during the Mt. Fuji Festival. This shrine was founded in 841. 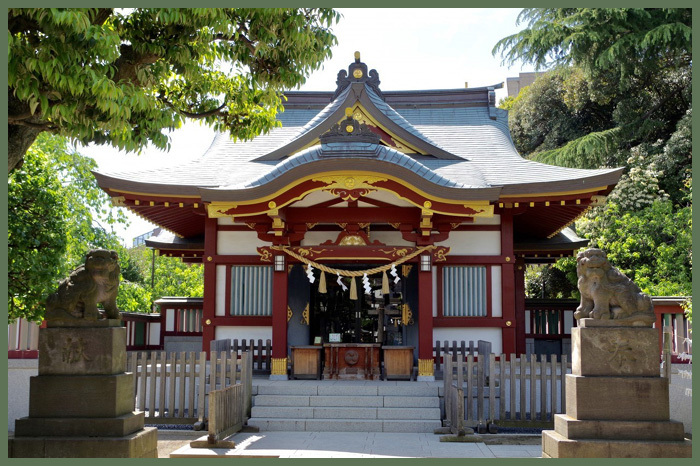 This shrine, close to the banks of the Sumida River, traces its origins back to a shrine constructed nearby in 1520, while it has been in its current location since 1642. Besides being the site of a number of interesting festivals throughout the year (including one that sees participants taking a dip in a pool on the second Sunday in January), arguably the main attraction is next to the actual shrine. Here, you'll find a mini Mount Fuji constructed from rocks carried from Fujisan itself by devotees, as part of an old tradition of worshipping the great mountain.
. Shrine 新富稲荷神社 Shintomi Inari Jinja . was born in the residence of the 奥平 Okudaira family at Edo Teppozu. known as one of the most active in learning the Dutch language, reading and translating Dutch materials, and organizing opportunities for others to learn the language. He studied with Yoshio Kôsaku, and was active in Rangaku circles of his time. Maeno writes of the virtue of European nations, and of the importance of the quality of a culture's religious teachings in ensuring peace and prosperity. He writes of the success of the spread of Christianity as evidence for the value of Christianity as a moralizing agent, and asserts that while China has seen numerous violent coups, no European ruler has ever taken power by violent usurpation. 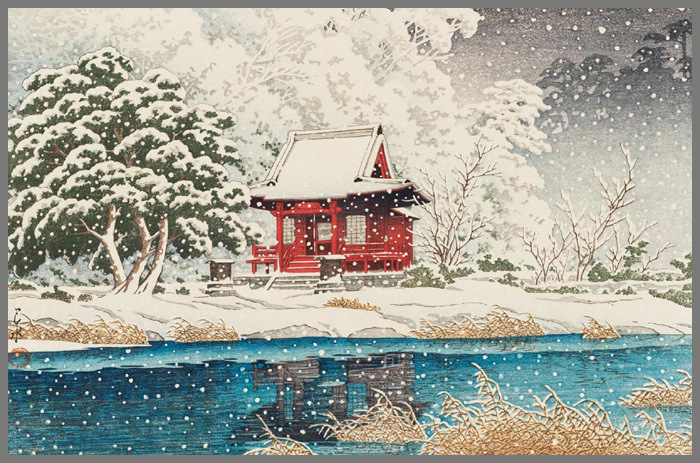 He never published his Kanrei higen for fear of running afoul of the shogunate, but manuscripts circulated among other Rangaku scholars, physicians, and translators.
. Medicine in Edo .
. kanchuu suiyoku 寒中水浴 midwinter bathing . 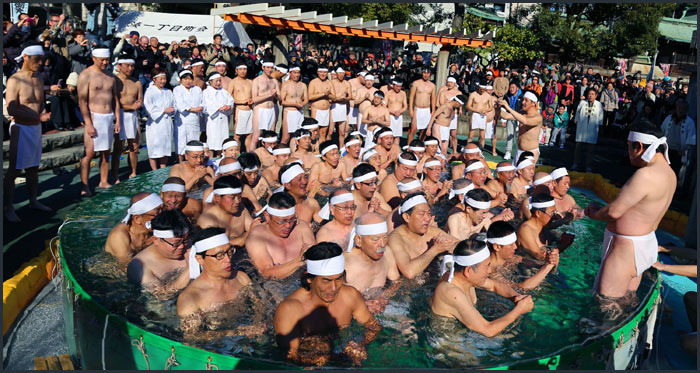 Men wearing only loincloths pour purifying water over themselves.
. mikoshi神輿、御輿 portable shrine . 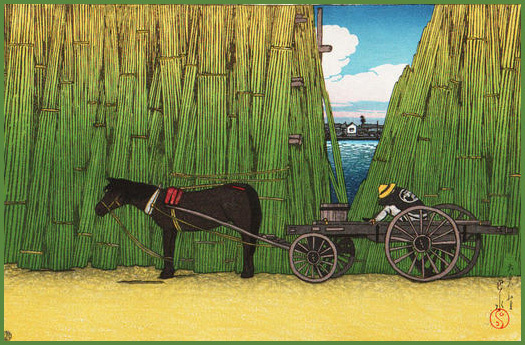 The name Komagata-Cho is mentioned in books since about 1661.
koma 駒 is another word for uma 馬 horse. Komagata means "form of a horse", "looking like a horse". 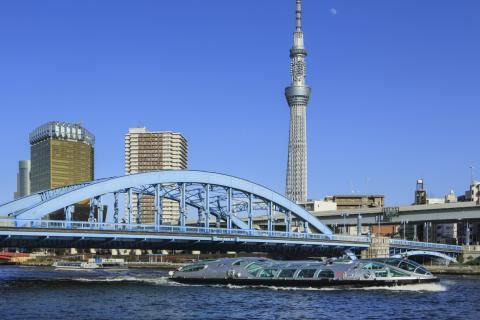 Thetemple hall 駒形堂 Komagata Do could be seen from boats down the river Sumidagawa, looking like a white horse running, koma kake　駒駆け. 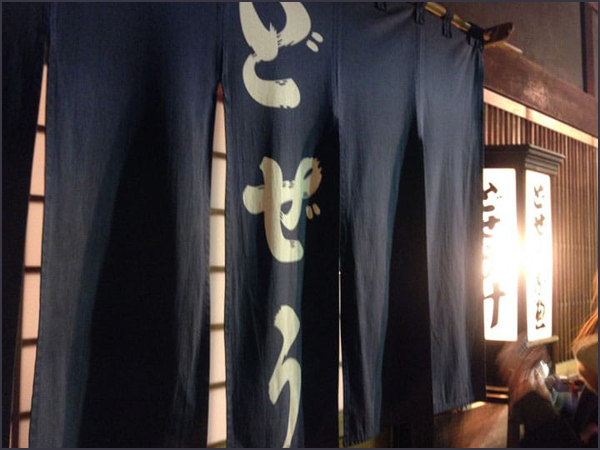 komakake changed in the local dialect to Komagata. 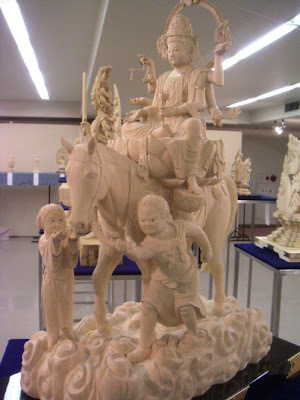 dedicated to the horse-headed guardian deity of mounted travelers, one of the many manifestations of the bodhisattva Kannon, marks the original gateway to Senso-ji, standing formerly on the threshold of the land and waters from where Kannon is said to have emerged in the ancient past. Because of this legend, the hall was originally facing the river, and fishing was forbidden as a mark of respect. 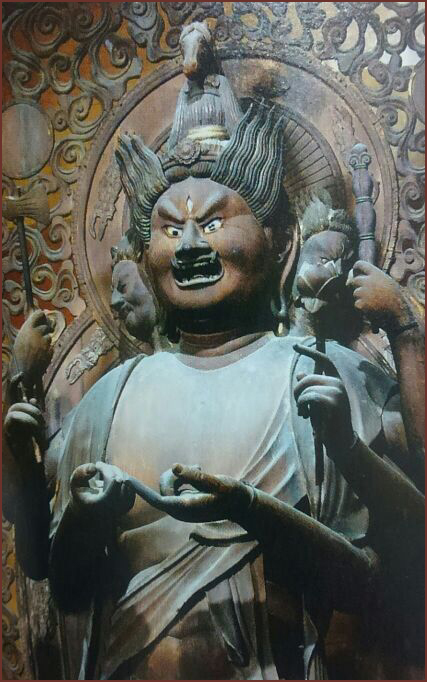 The main deity was Kannon Bosatsu, a statue which was found near the 駒形橋 Komagata bridge. 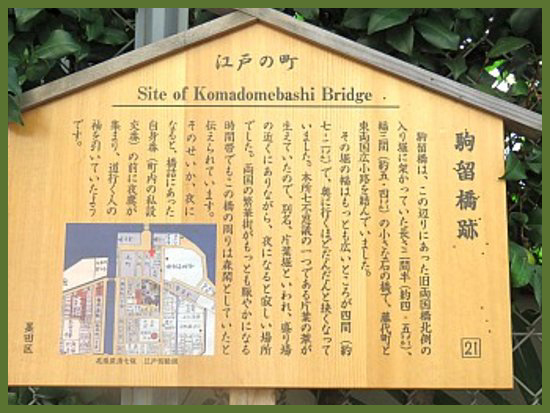 The first Komagata Do Hall was built in 942 by 平公雅 Taira no Kimimasa, right next to the boat landing place at the river. So visitors first came to the Komagata Do Hall to pray and then went to the Asakusa Kannon temple. The front of the temple was first located facing the river, but eventually it was rebuilt to show the back to the river. The present-day hall was built in 2003. 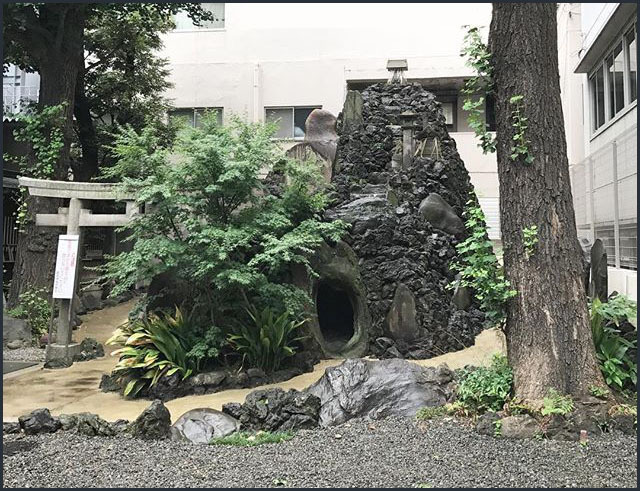 One priest of the Asakusa Kannon temple, 網野宥俊僧正, knew that the original place of the statue was in the Sumidagawa, so the Kannon must like fresh things from the water and thus he installed Bato Kannon 馬頭観音 the Horse-headed Kannon in the hall. For the people to pray to, he had the statue made like a horse (umagata 馬形), later written 駒形.
. Asakusa Kannon　浅草観音 - 浅草寺 Temple Senso-Ji .
. batoo Kannon 馬頭観音 Bato Kannon, "Horseheaded Kannon" .
. Deity 駒形明神 Komagata Myojin / 馬鳴菩薩 Memyo Bosatsu . 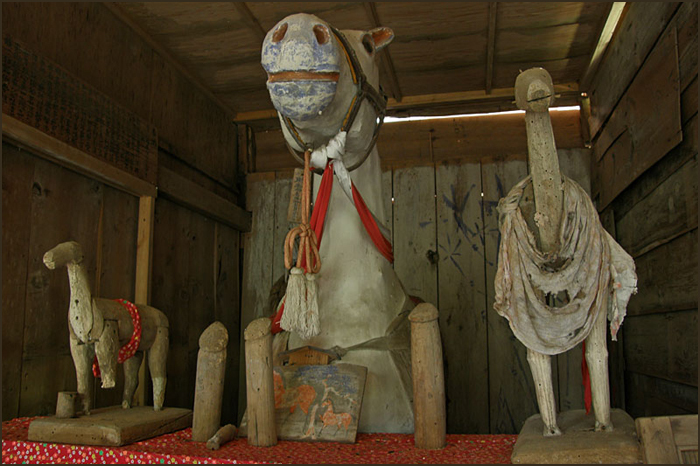 menari myoojin 馬鳴明神 "neighing horse deity"
. Komagata no ookami 駒形大神 the great gods of Komagata . 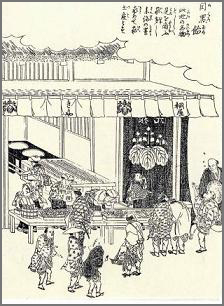 A horse had been drinking from the water under a rock of the shrine for 八大神様 Hachidai Sama (the eight dragon deities). It became very large and flew off to heaven. 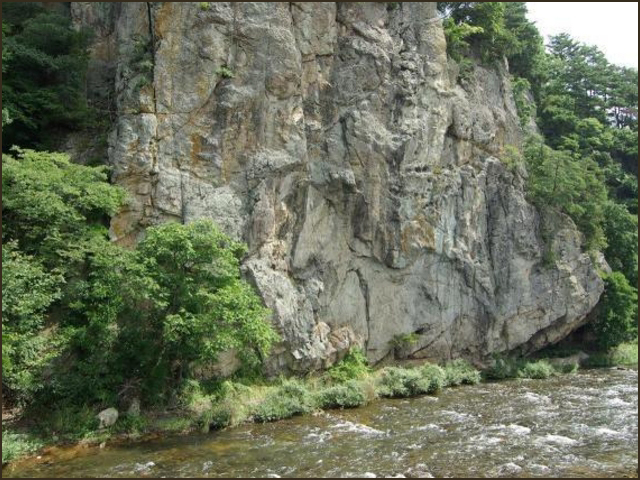 The footsteps of the horse are still seen on the rock and the region was called Komagata. Komagata mura 駒形村 Komagata village, now part of 喜多方市 Kitakata town. The deities from the mountains of 駒形根 Komagatane and 御嶽 Ontake came down to meet in 陸奥 Mutsu, near 築館 Tsukidate. Near the river 一迫川 Ichihasamagawa they found beautiful flowers in bloom and named the mountain 花山 Hanayama "Mountain with Flowers". On the way back the Kami from Ontake became sleepy, but the Kami from Komagatane kept going and pursued the way with the most beautiful landscape. This is now mount 御駒山 Okomayama. 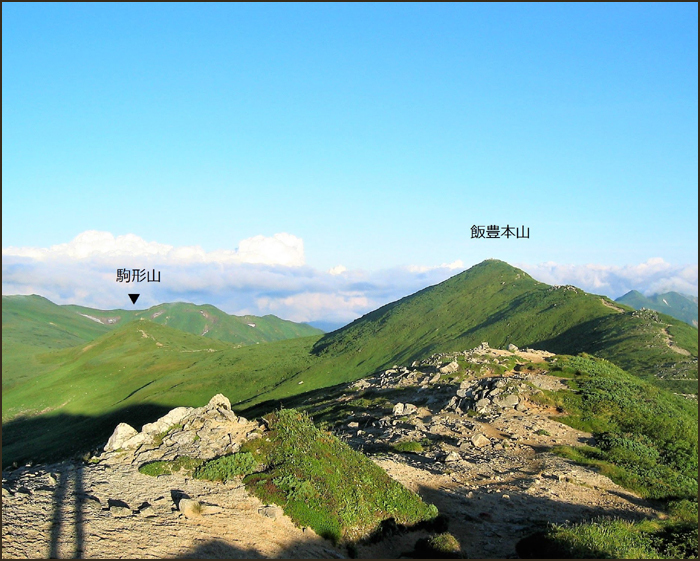 The Kami from Ontake came later and took another route. This is now 御嶽権現の山 the mountain of Ontake Gongen, where beautiful shakunage 石楠花 rhododendron are flowering. Komagatane Gongen became jealous and wanted some flowers too, but since he had left Ontake behind earlier on, he did not get any. To our day, these rhododendron flower only at mount 御嶽山 Ontakesan and not on mount 駒形山 Komagatayama. At 浅草駒形 Asakusa Komagata a female Ushi-Oni demon has been seen runing around. 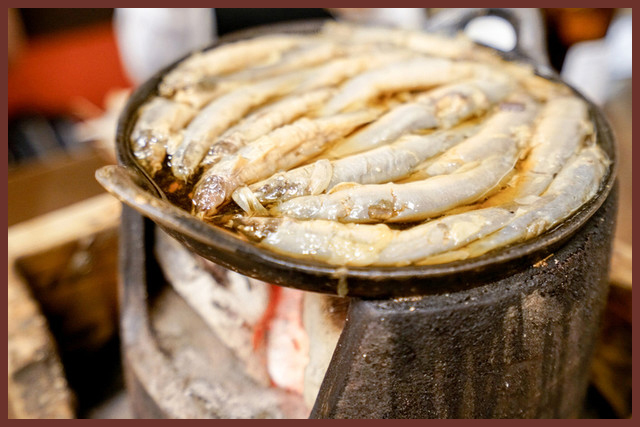 "Dozyo(Loach fish)" is one of the regional menus eaten by locals since Edo era (17th Century~). At those times there used to be shops selling "Dozyo-jiru", a dish of rice bowl with dozyo soup poured on. We can say that it was one typical fast food back then.
. dojoo 泥鰌 Loach, weather loach, weatherfish, Dojo loach . Its name is a kind of pun with the sound and meaning of himon (hibun) 碑文 meaning "inscription on a stone".
. hinoki 檜 or 桧 Japanese cypress . The Shrine dates back to the Kamakura period and has thus a long history. Hatakeyama Shigetada 畠山重忠 (1164 - 1205), a vassal of Minamoto no Yoritomo, came to this shrine to pray for victory in war. A vassal of Hatakeyama, 榛沢六郎　Hanzawa Rokuro, built a sanctuary for Inari 稲荷社 with a himon seki 碑文石 stone inscription of the name of Himonya 碑文谷. The stone is 75 cm high, 45 cm wide and 10 cm thick. It was made in the Muromachi period. In the middle is the Sanscrit letter for 大日如来 Dainichi Nyorai, on the left 勢至菩薩 Seishi Bosatsu and on the right 観音菩薩 Kannon Bosatsu. 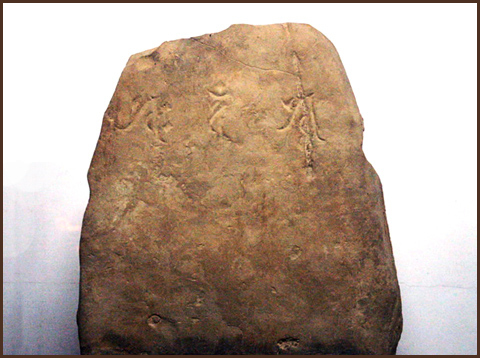 Some say the name of Himonya derives from the 碑文 Himon (Hibun) inscription of this stone. The original 社殿 Shaden Hall was erected in 1674 and rebuilt in 1872. In 1877 it was again refurbished. The shrine also has a famous 神楽殿 Kagura-Den for Kagura dance performances. With the separation of Buddhism and Shintoism, part of it became the temple 円融寺 Enyu-Ji (former 法華寺 Hokke-Ji). The compound is famous for a long row of cherry trees from the first to the second Torii gate. Sakura matsuri 桜まつり Cherry Blossom Festival during the season. The main Shrine festival is in Mid-September. They were grown in the 碑文谷村　Himonya village since 1772. After visiting the famous Meguro Fudo Temple, people would come here to buy the vegetables.
. Edo Yasai 江戸伝統野菜 Traditional vegetables from Edo .
. Meguro Fudo Temple 目黒不動尊 . Sometimes at the Torii gate of the shrine appeared a large straw rope. looking like a dragon with its tail on the ground. It is said to be a huge serpent from Mount Fuji coming to protect the Shrine from fire. In times of drought, people came here for rain rituals. The shrine is related to Himonya Shrine. 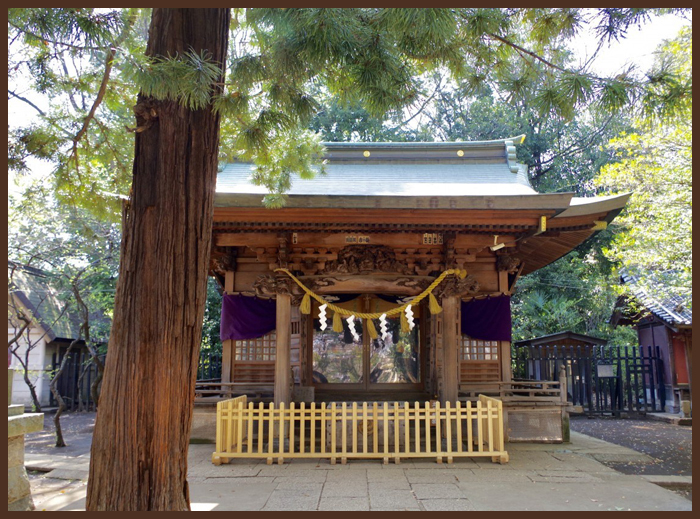 Okusawa shrine is a quiet emerald in a simple neighborhood, only a few stops from Meguro station on the Yamanote Line. 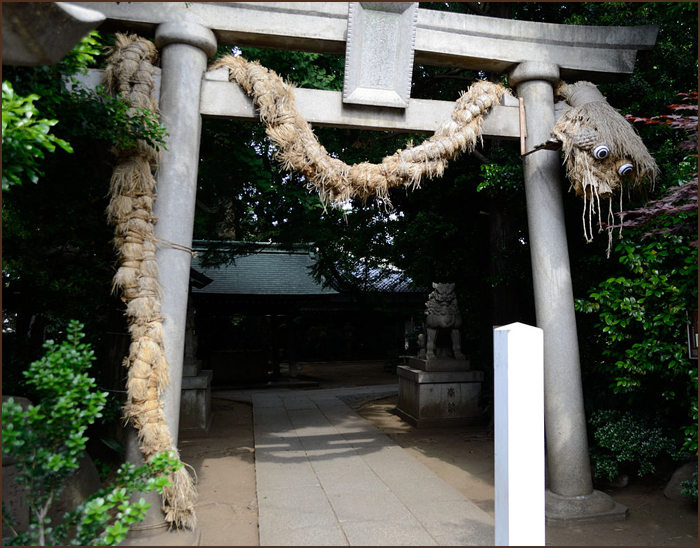 Built during the Edo Period, a huge snake made of straw lies guarding its entrance, wrapped heavily around the stone torii gate. Walk under this, and past the burly protective shisa lion-dogs, and the world behind you falls away. ... To the left behind Okusawa shrine is a little hollow. A tree stands tall, surrounded by low benches. A bamboo fountain bleeds water into another basin, which flows in turn into a shallow moat that runs around the main shrine. Here is another altar – the Cave of the Dragon – which is said to provide the snake at the entrance with its serpentine spine. Other small figures are hidden in the plants, all in the name of different spirits and gods. Bushu, Ebara district, Himonya village 武州荏原郡碑文谷村. In 1772 Annami became ill when he was about 25 years old and prayed for healing in the hall for many days. On the last day of his vow - indeed - his illness was healed. On the left side is the inscription 八まん Hachiman - short for 碑文谷八幡宮 Himonya Hachimangu. Hokke-Ji was built in the Heian period by 天台宗 the Tendai sect. During the Kamakura period it belonged to the 日蓮宗 Nichiren sect and in the middle of the Edo period it came back to the Tendai sect. At the end of the Edo period it was re-named 円融寺 Enryu-Ji. It smells quite different from shiso 紫蘇 Perilla. The leaves are eaten as a vegetable. Since it grows like a weed, it was very useful for farmers of old times to get over a period of famine.
. Shrine Ebara jinja 荏原神社 .
. Kamata 蒲田 "bulrush district" - Ota ward . This ancient district is already mentioned in the Heian period. Is hard to travel, indeed.
. The Legacy of Sakimori - the frontier guard conscripts .
. Musashi no Kuni 武蔵国 Musashi Province /Bushuu 武州 Bushu .